South Korea will take on Belgium in a World Cup 2014 Group H match on Thursday, June 26. Kick-off time is 4:00 p.m. EDT at Arena Corinthians, São Paulo. The game will be broadcast on SBS Korea and MBC Korea in South Korea, as well as Canvas, La Une, and RTBF LiveCenter in Belgium. The game will also air on STV Scotland, TalkSport Radio, BBC Radio 5 Live, ITV 1 UK, and UTV in the United Kingdom, as well as ESPN Deportes+, Univision Deportes USA, ESPN Radio, ESPN Deportes Radio, Univision USA, SiriusXM FC, ESPN, and Univision Deportes En Vivo in the United States. Live stream is available on Sporza Live Streaming, ITV Player, and Watch ESPN. MOGI DAS CRUZES, Brazil (AP) — For South Korea, 2002 is starting to feel like more than just a dozen years ago. The team that reached the semifinals at his home World Cup in its heyday has been struggling mightily in Brazil, where even a lucky break hasn’t managed to bring it close to the second round. South Korea is staring at an early elimination unless it can somehow beat already-qualified Belgium on Thursday in their final Group H game and have the result of Algeria-Russia go its way. But the team coached by Hong Myung-bo — who was the captain for its semifinal run in 2002 — still has an almost blind belief that things will turn, somehow. “We will now do our best to the very end of the competition. That’s the only option we have left,” Hong said. His team already benefited from a piece of luck when Russia gifted it the lead in their opening 1-1 draw, when Igor Akinfeev fluffed an easy shot for the biggest goalkeeper blunder so far of the World Cup. South Korea couldn’t hang on to the lead for more than six minutes, though, and its lightweight defense was further exposed when it conceded four goals in a loss to Algeria, making sure its two goals were for naught. Now it must overcome a Belgium side that is already through to the next round, but want to keep its perfect record going. Some key players will be missing for Belgium, though. Since starters Axel Witsel and Toby Alderweireld already have a yellow card and face the threat of suspension, they won’t start. 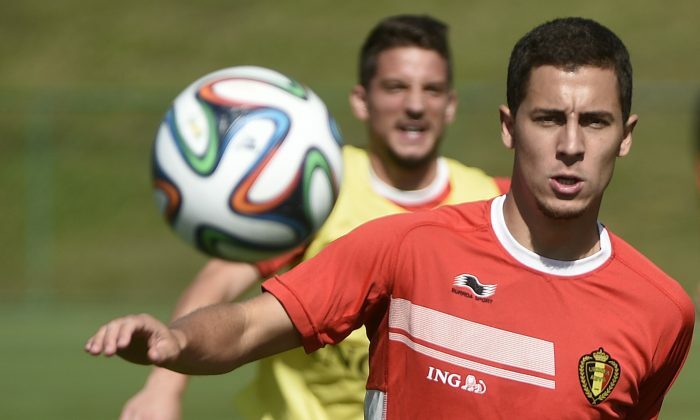 “Our focus is on the second round,” said Belgium coach Marc Wilmots. Wilmots is also considering sidelining captain and central defender Vincent Kompany to spare his groin from any more strain after he had to miss three days of training in the run-up to Sunday’s game against Russia. Even though Wilmots has successfully relied on a strong bench to get a 2-1 victory over Algeria and a 1-0 win over Russia, the weakened lineup could offer South Korea a chance to force a breakthrough and lift it from its last place in the group right into the second round. Russia plays Algeria at the same time Thursday, with every team still having a chance at advancing. Belgium is already through with six points from two games, with Algeria second on three points while Russia and South Korea have one each. Russia, however, has a better goal difference than the Asians. Even though Belgium will be willing to experiment a bit, it will also try to make sure to finish first and avoid a likely second-round match against the mighty Germans. The United States and Germany now share the lead of Group G but Portugal and Ghana also still have an outside chance to advance. Wilmots said though, that his team will always want to win any match, whatever the consequence. “I just want that first place. Whether we play Germany now or later, what’s the difference? For all we know, Germany might still finish second in its group,” Wilmots said.